On the 50th anniversary of the collapse of the Silver Bridge, Point Pleasant, West Virginia, a new Mothman book will appear. You can pre-order your book today, and be one of the first to receive your autographed copy. 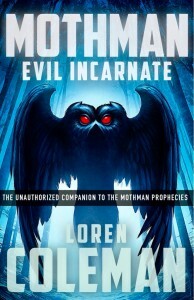 Mothman, Evil Incarnate: The Unauthorized Companion to The Mothman Prophecies (Cosimo, 2017) by Loren Coleman is a completely new Mothman tome. It has material on the 2017 Chicago sightings, background biographical insights on John A. Keel, the Michael Winkle annotations and links between The Mothman Prophecies book and film, an analysis of significant Mothman documentaries, and the updated Mothman Death List containing 100 named individuals and their stories. The cover art is by Claudio Bergamin. Pre-order this December 2017 release directly from the International Cryptozoology Museum gift store by CLICKING HERE. 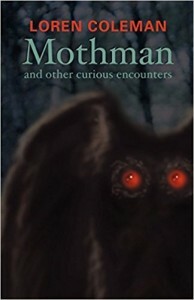 Mothman and Other Curious Encounters (Paraview, 2002) by Loren Coleman is a detailed retelling of the Flatwoods Monster story of 1952, the Mothman encounters of 1966-1967, other Winged Weirdies, and more of the spawn of John A. Keel. Cover art by William Rebsamen. Order this directly from the International Cryptozoology Museum gift store by CLICKING HERE. International Cryptozoology Museum giftstore – CLICK HERE. 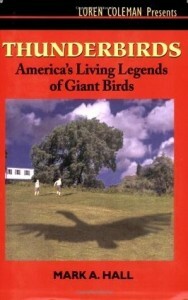 Thunderbirds: America’s Living Legends of Giant Birds (Cosimo, 2004) by Mark A. Hall; introduction by Loren Coleman. This is a compelling collection of evidence for giant condor-like birds (Thunderbirds in Native American traditions), as well as giant owls, e.g. Mothman, Bighoot, encountered around the world. Cover art by Mark Rollins. Purchase this from the International Cryptozoology Museum gift store by CLICKING HERE. All purchases from and donations to the International Cryptozoology Museum gift store benefit the nonprofit, 501(c)3 museum. 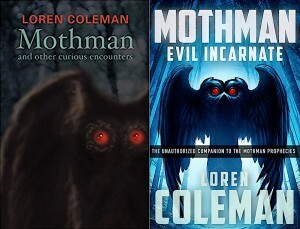 Thank you for your support through buying books on the Mothman, Thunderbirds, and other cryptids. Next Entry: Yetis Are Bears? Not So Fast!